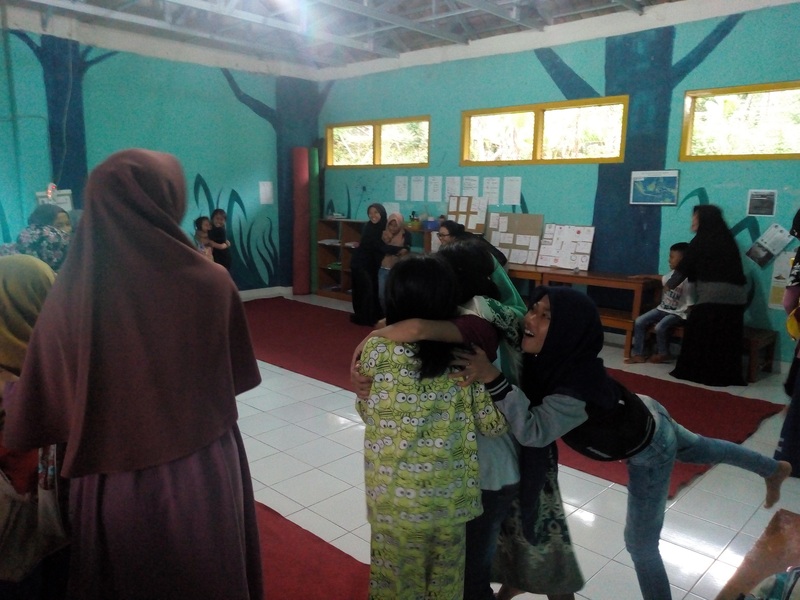 On the first day of March 2019, Sekolah Gunung Merapi (SGM) held its second “Creative Friday” event called “Clap Your Emotions”. The aim of “Creative Friday” or “Jumat Kreatif” is to encourage the students to be more creative, imaginative, and expressive. 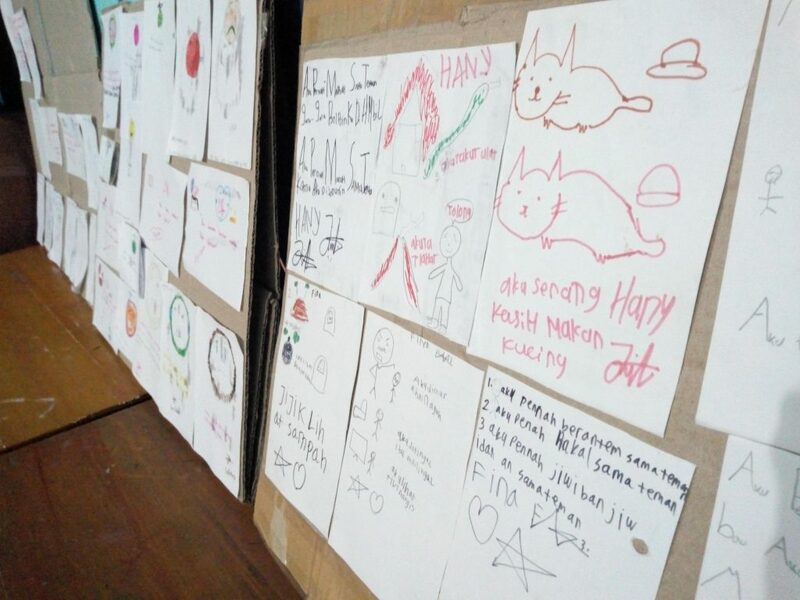 Other than that, in this “Jumat Kreatif” we wanted to introduce the kids to several kinds of emotion. Our hope is the kids can develop their creativity as well as learning important knowledge about themselves. To be familiar with emotions and learn how to deal with them are basic knowledge that must be learnt by young kids. Especially for those who live in areas with a higher risk of disaster, in this case the slopes of Merapi, having this knowledge could help them to better cope with trauma after a natural disaster. It is natural for people to cry, to be angry and to be scared. As human beings, we cannot deny the existence of our emotions. What we can do is to accept and learn how to handle them with care, something we hoped to achieve through this Jumat Kreatif event “Clap Your Emotions”. Developing emotional intelligence: research has shown that children with a strong support network comprised of friends and family is a key factor that protects children from developing PTSD after a disaster. By getting children used to sharing and talking about their feelings could be a way to help them build these support structures. The event started at 2 pm sharp. Even the gloomy sky could not stop the kids from attending and with so much enthusiasm. We sang “Generasi Tangguh” to start the event, a special song written about Merapi to remind kids what they should do in the event of an emergency. They seemed very excited when it was the time to play a little game with one of SGM’s volunteers to make the ambience more friendly and comfortable for the kids. Then, by the time the game ended they had divided into groups of three to five persons. After the game, we played a brief excerpt of the Disney animation film ‘Inside Out’. They sat around with their group and one of SGM’s volunteer who would lend a helping hand whenever they needed it. Then, the 3-minutes video was played with the kids being so attentive. They were immersed with the story about a newborn baby girl and the emotions that started to show up inside her. It was such a relief when Anisah, one of the volunteer, tried to review what the story was about and they could answer it right away. The kids also easily named the emotions that appeared in the video very clearly: Joy, Sadness, Anger, Fear, and Disgust. What’s more, they were able to mention the situations which trigger the emotions to control the main character’s feeling. Learning to differentiate emotions: using pictures as stimuli for discussion, we wanted to get children more used to naming different emotions and to be aware of how emotions can influence people’s actions. Based on the information about emotions they had gathered from the video, we showed them pictures that captured situations which probably had happened or will happen in real life. Piles of garbage scattered in the side of the road and two kids glared to each other ready to fight were some of pictures that we presented to them. They were asked to identify what kind of emotions came up when looking at those photos. At first, the kids shared the same opinion about the pictures until a photo of deep sea creature appeared. It was interesting to see their thoughts differed. Some of them said the photo disgust them, but others said it was very scary. A display of our students stories about different past experiences of their emotions. To be aware of their own emotions is the highlight of this event. So, the kids continued to draw relation between pictures and emotions, but this time they were focused on group and expressed their emotions through drawing and writing a simple sentences. Five pictures represented each of the emotions were shown one by one. Although some of the kids were still shy and seemed not sure on how to express their emotions, many of them expressed it easily. They mentioned what immediately came into their mind when looking at the pictures. On a piece of paper, those little hands tried to draw a happy face after seeing a picture of kids playing in the rain. Bright colors were chosen to shape the smile on the face. To complete the drawing, they attempted to write kinds of activity or situation referring to the feeling of happiness. There were kids who wrote a brief paragraph, but most of them were content to write one single sentence. After putting an effort to draw and write, each of them finally finished with five drawings. Who knows that a simple activity such as gluing on a paper can be so much fun for the kids? They took turn to glue their paper with that colorful drawing of their own, then sticking it onto a piece of carton. After that, they made a big circle just like when they had first started the event. Though, instead of singing Generasi Tangguh, they learned a new song titled Clap Your Emotions. While having fun singing this song, the kids actually were given the idea to feel okay to express their emotion through the lyrics. “When you’re feeling sad, hug your friend”: all of our emotions, including the unhappy ones are experienced by everyone at some time, and all are equally important to be acknowledged. The aim of this simple song is to introduce simple positive strategies appropriate for when we experience darker emotions such as sadness, fear and anger. If sadness comes you can hug your friend. If you are angry take a deep breath. If you feel happy you can say ‘hooray’. If something disgusts you, then clean them up. If you feel scared you can ask for help. They memorized the lyrics in a second and sang it twice while dancing throughout the song. Just before closing the event, Anisah began to give a brief explanation that emotion is not a word to define something negative like they used to know. The kids really paid attention to Anisah when she described emotion as a natural response from human being to their environment, so we shall not hide it. As for example, if the kids feel angry, they can take a deep breath just like the song they sang, make a doodle, even crying. “But, do not ever hurt your friend when you’re angry,” the kids nodded to Anisah’s advice. In this event, Anisah tried to clarify that everyone can cry, even the boys, because everyone has emotions. Of course the result cannot be seen instantly. They still said ‘no’ when later, Anisah asked the exact same question right after the explanation just ended. Thus, another event with the same or similar theme aiming for deeper understanding about emotions might be held sometime soon. It started to drizzle when the kids were ready to go back to their home. They took off from school with big smiles on their face. They had so much fun that afternoon. Hearing that from the kids, all those hard work and effort paid off. 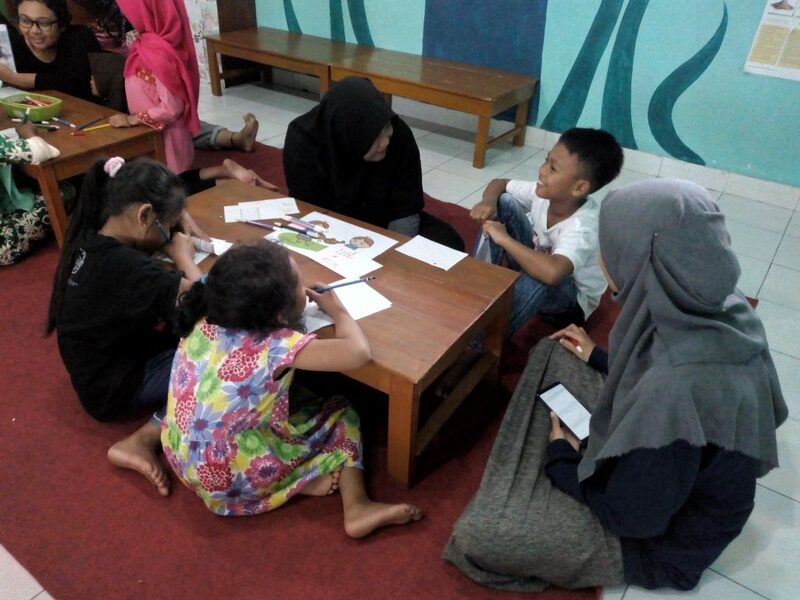 It was not a perfect event, but at least they had a great time and the main goal of Jumat Kreatif had been reached. Thanks so much to every student and volunteer that took part in and supported this special event. 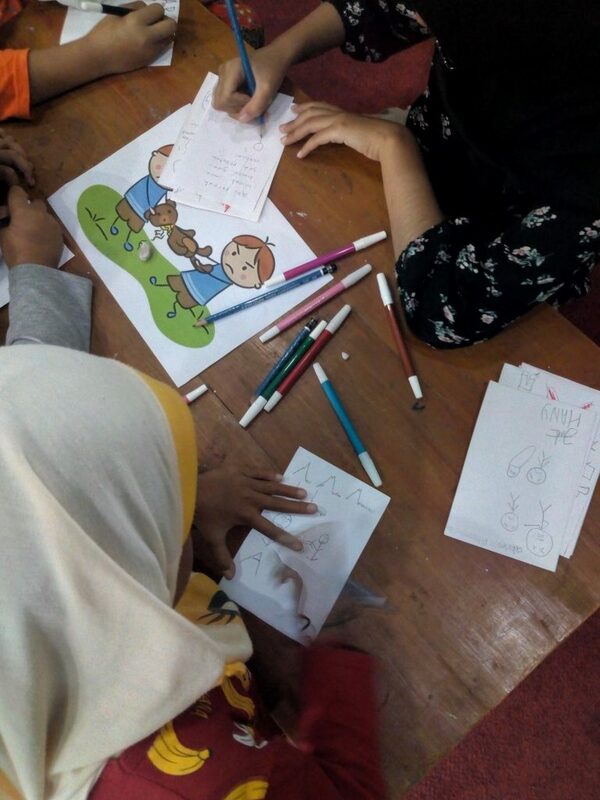 This article was written and translated into English by Ardelia Karisa, with support and editing by Anisah Zuhriyati, both of whom have been volunteering at SGM since January 2019. A beautiful heart shaped creation! Group 1 pose proudly alongside their mentor Lieska. ← What’s new? Mitigation education, creativity and music from Merapi.